“The Battle of Evermore” is an acoustic guitar and mandolin song by Led Zeppelin. It is featured on their fourth album, Led Zeppelin IV, released in 1971. The tune for this was written by guitarist Jimmy Page at Headley Grange while he was experimenting on the mandolin owned by bassist John Paul Jones. Vocalist Robert Plant had recently been reading about Scottish folklore and this inspired him to write the lyrics to this song. Plant felt he needed another voice to tell the story, and for the recording of this song folk singer Sandy Denny was invited to duet with Plant. Denny was a member of British folk group Fairport Convention, whom Led Zeppelin had shared a bill with in 1970. Plant played the role of the narrator and Denny represented the town crier. To thank her for her involvement, Denny was given the symbol on the album sleeve of three pyramids (the four members of Led Zeppelin each designed their own symbols for the album). This is the only song Led Zeppelin ever recorded with a guest vocalist. “The Battle of Evermore” was played live at Led Zeppelin concerts during the band’s 1977 concert tour of the United States. 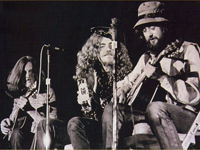 For these live performances, Jones sang Denny’s vocals with Plant and played acoustic guitar while Page played mandolin. Sometimes drummer John Bonham sang Denny’s vocals instead of Jones. * Page and Plant also recorded a version of the song in 1994, released on their album No Quarter: Jimmy Page and Robert Plant Unledded. Singer Najma Akhtar sang Sandy Denny’s vocal part. * The song was covered by Ann and Nancy Wilson of Heart, credited as “The Lovemongers”, on the soundtrack to the 1992 film Singles. * The song was covered by a group called “The Fellowship” on their album In Elven Lands. The Fellowship included singer Jon Anderson from the band Yes, though he does not sing on “The Battle of Evermore”. * Robert Plant and Alison Krauss regularly covered “The Battle Of Evermore” on their tour of USA and Europe in April and May 2008.